In Michael Carroll’s Awake at Work, the author shares 35 practical Buddhist principles for discovering clarity and balance in a chaotic workplace. One of the key principles is the ‘Cultivate the kitchen sink mentality.’ Carroll explains how in our home kitchen, we ensure that the sink is clean before performing any tasks. If the sink is dirty, offensive orders and clutter distracts us from staying on task. Certainly no one would ever wash dishes in a dirty sink; hence the cleanliness of the kitchen sink takes precedent over other kitchen chores. Carroll states, “Cultivating a kitchen sink mentality encourages us to treat our mind like the kitchen sink in our pursuit of livelihood. Rather than attending to the problems by using “everything but the kitchen sink,” we actually begin with the kitchen sink mentality.” It is a state of being fresh, orderly and complete. This mentality should also be applied at work. Often times, our desks are messy; our computer screens are swimming in a sea of sticky notes; our files are unorganized or we have too many windows open on our computers which causes the operating system to slow down. All of these scenarios require taking time to organize and settle so that we may focus clearly on the task at hand. Our own minds frequently work in overdrive such that we need to apply the ‘kitchen sink mentality’ as well. Meditation is an ideal form of the application of the ‘kitchen sink mentality’ to our minds. A recent article in USA Today explains how meditation can keep you more focused at work. The article describes an in-depth study performed by David Levy, a computer scientist and professor with the Information School at the University of Washington. He and his research team found that the experimental meditation group not only had lower stress levels during the multitasking tests, however they were also able to concentrate longer without being distracted. For the other two groups- those who received relaxation breathing training and those who had no initial training, stress did not decrease. When the third group received meditation training after eight weeks, their stress level decreased the same as it had for the original meditation group. The study also found that those who meditated actually spent more time on tasks and didn’t switch between different chores as frequently, yet they took no longer to complete the tasks than the other participants. Bottom line: the subjects who had meditation training were able to stay on task longer and were less distracted. The study’s conclusion is the ‘kitchen sink mentality’ at work. By focusing on breathing through meditation, the brain is able to settle and strengthen. “Meditation is a lot like doing reps at a gym. It strengthens your attention muscle,” Levy stated. Many organizations now offer meditation training. 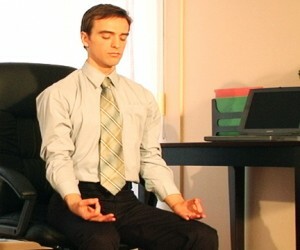 For example, Google’s “Search Inside Yourself” classes teach mindfulness at work. Employees who have taken the course said that they now have an increased level of focus and less stress. There is no better time than right now to apply the ‘kitchen sink mentality’ to your life by meditation. In its simplest state, meditation is a matter of sitting and paying attention to your breathing. When your mind wanders to the next thought, task, or something you forgot to do, just bring it back to your breathing. Afterwards, you will feel refreshed, ready to attack any task at hand- anything but the kitchen sink.